Geotrails provide a unique tourism experience by guiding visitors on a journey that is focused on the local geology. They are designed to promote an understanding of earth sciences by enabling people to explore the natural environment and learn about its diversity. Geotrails may feature walking tracks and driving routes, lookouts, points of interest, visitor centres and supporting information to encourage learning and an appreciation of our environment. 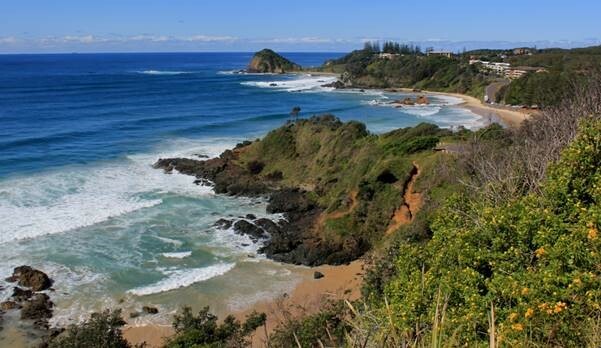 The new Port Macquarie Coastal Geotrail is a 4 km walk along the coast from Shelly Beach to Rocky Beach that tells the story of plate tectonics and how Earth’s crust was formed. The geotrail features rocks formed by volcanoes, microscopic marine animals, ocean currents, and extreme temperatures and pressures up to 100 km below Earth’s surface. The Port Macquarie Coastal Geotrail provides a unique scientific recreational experience for the local community, including school groups, and for visitors to the Port Macquarie–Hastings region. The collaborative geotrail project was led by the University of Newcastle. The Department of Planning and Environment’s Geological Survey of NSW (GSNSW) and the National Parks and Wildlife Service (NPWS) have had significant input. 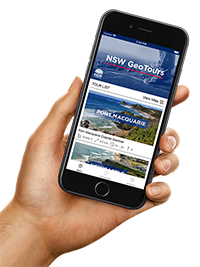 The NSW GeoTours app provides the public with a free self-guided tour that can be pre-loaded onto mobile phones or tablets, with key sites geotagged stop-by-stop along a geotrail using the device’s inbuilt GPS. Access the Port Macquarie Coastal Geotrail tour by downloading the NSWGeoTours app (Android and Apple). A brochure including a map of the geotrail tells the story of how the area was formed and highlights the geology along the way, so visitors can identify various rock formations and learn how they came to be formed. The brochure is available for download or is free at the Sea Acres Rainforest Centre, 159 Pacific Drive, Port Macquarie. The Port Macquarie Coastal Geotrail is accessible by foot or by vehicle. You can travel in the same direction as the oceanic plate was moving, from Shelly Beach and Sea Acres to Rocky Beach and Town Beach, or you can do the reverse. Alternatively, you can drive to key stops that are accessible from nearby carparks, or use public transport to the Sea Acres Rainforest Centre.